The Thermal Analysis (VITA) module enables nanoscale thermal analysis (nTA), a novel technique that allows the determination of the local transition temperature on the surface of a material with nanoscale spatial resolution. By providing quantitative characterization, nTA can help identify materials and their phase separation and component distribution (or aggregation) at the nanoscale. The technique utilizes a specialized thermal probe to heat a very small region on the sample surface and locally measure its thermal properties, including such thermal transitions as melting points and glass transitions. The thermal probe is similar in geometry and physical characteristics to standard silicon atomic force microscopy (AFM) probes, and thus enables the generation of highresolution sample topography maps using contact mode and TappingMode™ techniques. The AFM image can be used to target locations of interest for thermal analyses, which can then be executed in a matter of seconds. In this way, nTA marries the resolution of AFM to the unambiguous and quantitative data of thermal analysis. This application note describes the technique and demonstrates its benefits in a number of applications. Thermal methods, such as differential scanning calorimetry (DSC), thermomechanical analysis (TMA), and dynamic mechanical analysis (DMA), are well-established techniques for characterizing the transition temperature of materials. However, a serious limitation of conventional thermal methods is that they give only a sample-averaged response and cannot provide information on localized defects, nor can they give the thermal properties of coatings/films less than a few microns in thickness. A DSC measurement, for example, may indicate the presence of more than one phase, but the technique cannot generally give any information regarding the size or distribution of phases. This particularly impacts scientists working with polymer blends (where the blend morphologies are crucial to determining their material properties), coatings (where imperfections such as gel formations can seriously impact performance), multilayer films, and composites. AFM has been routinely used to characterize the topography of such materials, as well as the distribution of their components. In some types of samples, the material, if known, and its form can be determined from the topography or the mechanical property variation revealed in AFM images. Traditionally, this has been accomplished through a number of scanning probe microscope (SPM) modes, such as lateral force microscopy (LFM), force modulation, and TappingMode phase imaging. More recently, the introduction of HarmoniX™ has provided a unique combination of highest resolution, fast, nondestructive imaging with quantitative mechanical property imaging. HarmoniX is ideal for mapping nanoscale variations in mechanical properties. Whenever components or microphases exhibit significant differences in mechanical properties, these techniques can also provide an unambiguous component and phase distribution. The advantage of nanoscale thermal analysis (nTA) is that it can provide an unambiguous nanoscale material identification even in the absence of mechanical property variations. 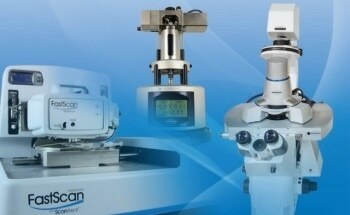 It allows the determination of local transition temperatures on the surface of a sample. This is accomplished by bringing a specialized probe into contact with the sample surface, heating the end of the cantilever, and measuring its deflection using the standard beam deflection detection of the AFM. During the measurement, the probe is held at a fixed location on the surface of the sample. As the cantilever and, in turn, the sample heat up, the sample will expand, pushing the probe up and causing an increase in the vertical deflection signal. At a transition temperature, the material typically will soften such that the force applied by the cantilever can deform the surface of the sample, allowing the probe to penetrate the sample and decreasing the deflection of the cantilever. The change in slope of the deflection signal is an indication of a thermal transition. This technique is similar to the bulk thermal analysis technique, Thermomechanical Analysis (TMA), but it can determine the transition temperature of a sample locally on the micro- and even nanoscale. The transition temperature as measured by nTA typically correlates well with the transition temperature measured by bulk techniques, and can be therefore used to identify a material and to determine whether it is in a crystalline or amorphous form. The specially designed AFM cantilevers used for nTA incorporate MEMS technology to create a conductive path through the legs of the cantilever and a high-resistance portion near its end. This causes the end of the cantilever to heat up when current flows through the conductive path. The cantilever itself is made of silicon and the path is created by implanting the silicon with different dopant concentrations. Figure 1 shows an SEM image of the thermal probe used in nTA. The probe has a similar aspect ratio and end radius to standard etched silicon probes, allowing high-resolution imaging in either contact mode or TappingMode. Because the material is doped silicon, the cantilever can withstand much higher currents than metal film cantilevers, and therefore achieves much higher temperatures. Controllable heating can be performed up to temperatures as high as 350-400°C. The high thermal conductivity of silicon enables very high temperature ramp rates, reaching maximum temperature in less than 100 microseconds, thus allowing for rapid (high throughput and localized) sample heating. An additional benefit of the cantilevers is their ability to withstand pulse heating to around 1000°C, which can be used to clean off any contamination that adheres to the apex of the probe. The temperature range accessible with the nTA probes, and the need for localized sample heating (thus limiting thermal conductivity of the sample) makes the nTA technique an ideal match for polymers. Thus, nTA applications have been focused on polymeric and pharmaceutical materials. Following are a number of applications in these areas showing the utility of nTA to more fully characterize a material at the nano- or microscale. In addition, the usage of the heated probes in scanning probe microscopy is continuing to develop new and interesting techniques and applications, from nanoscale lithography to temperature-dependent electrical characterization of samples. Polymer blends are used in a wide range of industries due to the fine tuning of material properties possible through proper component choice. 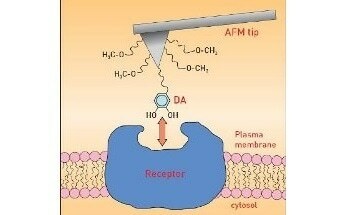 AFM has been used to help characterize the domain size and distribution in a wide range of polymer blend samples. As shown in figures 2 and 3, the domains can be visualized using both topography data and phase imaging. This constitutes an ideal starting point for nTA, which can then be used to help identify which domain is which, as well as if the domains are fully phase segregated or are intermixed. Since the samples in these figures are immiscible blends, the primary question is which material is which. Figure 2. 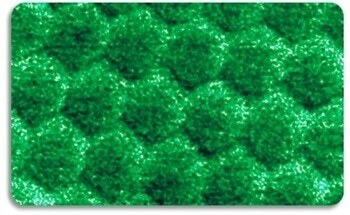 (a) 4µm x 4µm TappingMode AFM image of a polystyrene - low-densitypolyethylene (PS-LDPE) blend. The red and blue circles highlight the location utilized for VITA measurements in the PS domains and LDPE matrix, respectively. (b) VITA nTA measurements showing reproducibly the PS glass transition temperature inside the domains and the LDPE melting transition in the matrix, thus identifying the component distribution unambiguously. Figure 3. (a) 4µm x 2µm TappingMode AFM image of a polyethylene oxide - syndiotactic polypropylene (PEO-sPP) blend showing both topography (left) and phase (right). The red circle highlights a small domain and the blue circle highlights a similar domain after the nano thermal analysis was performed. (b) VITA nTA measurement performed at the location of the blue circle. The curve shows a transition temperature characteristic of PEO, followed by a sPP melt transition. 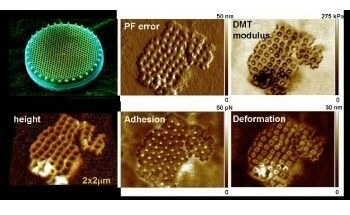 Apparently, the small features visible in the AFM images represent shallow PEO domains that are readily traversed, allowing the probe to sense both the small PEO domain and underlying sPP matrix. All of the materials in these blends (polystyrene, low-density-polyethylene, polyethylene oxide, syndiotactic polypropylene) are relatively stiff in comparison with the cantilever at room temperature, so material identification based on mechanical property variation can prove unreliable. Transition temperatures, on the other hand, differ greatly between the components, allowing for straightforward component identification using nTA. Further information about domain thickness can be gleaned in the case of the polyethylene oxide - syndiotactic polypropylene (PEO-sPP) blend, where probe penetration into small PEO domains is seen to be quickly followed by penetration into an underlying sPP matrix. The nTA data presented here (figures 2 and 3) were generated using heating rates of 5°C per second. While significantly faster than heating rates typically employed for bulk thermal analysis, this high rate is typical for nTA and it enables localized heating and high throughput. The unambiguous determination of blend distribution shown in figure 2 was accomplished within just a few minutes. The instrumentation allows adjustment of the heating rate over a wide range to both slower and significantly faster heating rates, as required for the experiment. Multilayer films represent a standard choice of material for most packaging applications. The different layers in a multilayer film contribute different attributes to the final film, including physical rigidity and barrier properties. While bulk thermal analysis can be used to measure the complete composite stack, nTA allows individual, in-situ thermal property measurements within individual layers. 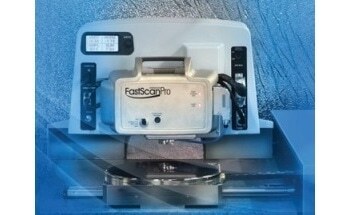 This enables the identification of each layer, as well as the identification of individual defects within any layer. Additionally, the transition temperature of the individual films can be mapped to detect the possible presence of transition temperature gradients or inhomogeneities. Thermal gradients through the thickness of the film can occur during processing of the film due to differences in thermal history between the two sides. Figure 4 shows an example of a simple multilayer film used for food packaging. The center ethylene vinyl alcohol (EVOH) film is used as a barrier film and has a lower transition temperature than the adjacent "tie" layer or the outside high-density polyethylene layers. Organic polymeric materials are widely used as coatings in a growing number of applications due to the opportunities they provide for fine tuning performance, in particular appearance and such surface properties as corrosion resistance. As the range of applications grows and the requirements become more demanding, coating complexity is increasing and thickness is decreasing. This trend towards thin, complex coatings hampers investigation with traditional thermal analysis equipment. An additional challenge arises from the recent focus on the curing rate, where environmental regulations and manufacturing cost considerations are driving a minimization of drying time. Thus, the analysis of coatings increasingly demands spatial and temporal resolution. The nTA technique meets all the requirements imposed by modern coating applications. An individual measurement is performed within seconds, allowing for the quantification of curing times that are minutes in duration. The nanoscale spatial resolution afforded by nTA extends thermal analysis to thinner coatings, and by offsetting the probe a small distance laterally after each measurement to an undisturbed location, either spatial inhomogeneities or time dependences can be determined. Figure 5 shows an example application using VITA nTA to identify the distribution of materials in a two-component solid lubricant coating. The two materials were spray deposited together on an aluminum substrate. Optically, it appeared that the coating was not continuous. 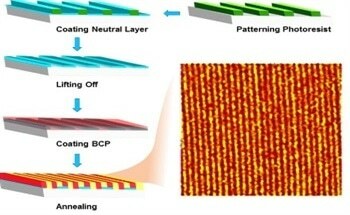 However, neither optical nor AFM data could differentiate the two materials. By using nTA, the uncoated surface could clearly be identified because of the lack of probe penetration into the surface throughout the temperature range, as demonstrated with the green curve in the VITA data. The two other components could be identified by their easily distinguished transition temperatures of ~85°C versus ~125°C. By mapping a number of the islands, it was also shown that the two components formed separate islands and did not intermix. Figure 5. An optical image (right) of a two-component solid lubricant coating. The circles indicate locations where nTA data was taken, and the colors correlate with the curves in the graph (left). The nTA data in the graph clearly identifies the two different coatings by their distinct transition temperatures. The complete absence of transition temperatures in the green curve shows that neither component is present at the location of the green circle. By enabling nanoscale thermal analysis, the VITA module combines the worlds of microscopy and thermal analysis, thus revealing the spatial distribution of thermal properties and inhomogeneities. This ability makes the VITA accessory uniquely valuable in applications ranging from analysis of polymer blends or composites to in-situ measurements of thin coatings. The technique is made possible by a microfabricated thermal probe that allows scientists to heat samples locally and measure thermal properties of regions on the nanoand microscale.